Susan Wise Bauer’s history book for high schoolers and adults…for five dollars off the cover price! 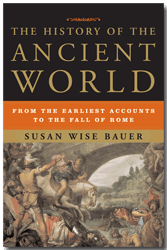 Using the narrative approach to history so popular in the Story of the World series, Susan Wise Bauer introduces readers to the people, places, and events of the ancient world. This lively and engaging narrative history shows the common threads in the cultures that gave birth to our own. This is the first volume in a bold new series that tells the stories of all peoples, connecting historical events from Europe to the Middle East to the far coast of China, while still giving weight to the characteristics of each country. Susan Wise Bauer provides both sweeping scope and vivid attention to the individual lives that give flesh to abstract assertions about human history. Dozens of maps provide a clear geography of great events, while timelines give the reader an ongoing sense of the passage of years and cultural interconnection. This narrative history employs the methods of “history from beneath”–literature, epic traditions, private letters and accounts–to connect kings and leaders with the lives of those they ruled. The result is an engrossing tapestry of human behavior from which we may draw conclusions about the direction of world events and the causes behind them. This book is ideal for high schoolers or for adults who want the great history instruction their children are receiving. Use the History of the Ancient World Study Guide to transform it into a full year of high school history study! “Bauer’s elegant prose and her command of much of the material makes this a wonderful starting point for the study of the ancient world.”–Publishers Weekly. Follow the story onward with the History of the Medieval World and the History of the Renaissance World! I am using the Story of the World with my young children and I decided to get this book to gain a little more insight myself. It has been a wonderful experience. Susan Wise Bauer does a lovely job of including information from several early civilizations. She manages to give plenty of fascinating detail without overwhelming the reader. You can read straight through, or take opportunities to follow the rabbit trails. I’m excited to get the next book in the series. The History of the Ancient World is Out of Stock currently. Do you have an idea of when it will be in stock? We have ordered more, and they should be back in stock in 7-10 days. When will ‘History of the Ancient World’ be back in stock? More books are on their way, and should be here in 7 or 8 days. Hi, I ordered Th e History of the Ancient World book and study & teaching guide recently and received them last week. Is there an audio version of the text that we can access? The audio version of “The History of the Ancient World” is available on Amazon and Audible.com. It’s very good! It is read by John Lee. I will have a 3rd grader and a 6th grader this coming year. Would this book be too advanced for the 6th grader? What are the options for a middle school student for history curriculum? Would this be appropriate to use with my advanced 6th grader? Even with an advanced student, we really don’t recommend this series for students before 9th or 10th grade. But you can always try it and see, and return the book within 30 days for a refund if it’s too much for the student. Will you be putting this high school version on audio as you did with SOTW? We enjoyed the audio CD’s so much! This series has now been released in audio form by its publisher, W.W. Norton! They are available on Amazon and on Audible.com.